Fort Mason here in San Francisco plays home for some great annual wine events including ZAP, a Zinfandel focused event that had 273 wineries pouring zins. We tasted some great zins from all over. I was definitely reminded how much I like zins from Dry Creek, Amador county, Lodi and Russian River Valley. - Murphy Goode who I usually count on for a reasonably priced Cabernet Sauvignon. They were pouring a 2004 "Snake Eyes" that was great. - Taft Street Winery out of Sebastopol had a lovely 2005 Cobblestone Vineyard at a reasonable $22. Well, I am no expert on French wines but here are some of the basics. In France instead of marketing wines based on a varietal they are grouped based on the region that the wine was made. A few of the better known regions are Bordeaux, Burgundy and Rhone. Rhone is best known for blends of varietals including Syrah, Grenache & Mourvedre, while a Burgundy is French Pinot Noir (produced in Burgundy of course). Cabernet Sauvignon and Merlot are the stars of Bordeaux while blending grapes such as Malbec, Cabernet Franc and Petit Verdot play a supporting role. So a Bordeaux blend is typicaly Cabernet Sauvignon and or Merlot with a little Malbec, Cabernet Franc and or Petit Verdot blended in to add some complexity to the final wine. In California we have a similar blend called a "Meritage". Meritage rhymes with heritage although many over confident tasting room lackeys will correct you with a Fench sounding meritage (rhyming with my mother's favorite 70s craft decoupage. According to US you only need 75% of any given varietal in a bottle to sell it as that varietal so you have probably had many bottle of "California Cabernet Sauvignon" that were actualy Bordeaux blends / meritages. In the past 10 years it has become much more common and lucrative to blend and market wines as a meritage. 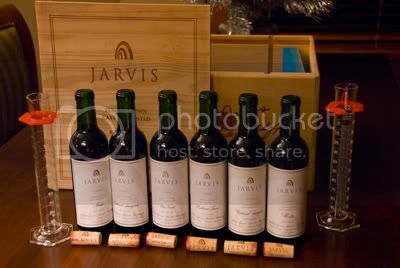 As part of a Lake Tahoe New Year’s celebration this year we broke open a 1999 Jarvis Bordeaux blending kit. The idea of this kit is to be able to make your own blend from the 5 Bordeaux varietals: Cabernet Sauvignon, Merlot, Cabernet Franc, Malbec and Petit Verdot. So you start by tasting each varietal on its own which in itself was a great experience. Have you ever tasted a single varietal Petit Verdot? I hadn't. It was very hard and tannic in nature. It was easy to see why it is usually about 2%-5% in many Bordeaux blending recipes. The Cabernet Sauvignon was amazing on its own. It had that classic big cab feel but the 8 years in the bottle mellowed it to perfection. It was the only varietal that had much fruit left. The blending was good fun. We had two 100mm cylinders (think 8th grade science lab) that you would add wines to. Then we mixed by pouring from one instrument of science to the next before pouring tastes around the table. We had plenty of missed blends along the way but our winning recipe ended up being 80% Cabernet Sauvignon 15% Merlot and 5% Cabernet Franc. This was the blend that you would put against a Joseph Phelps Insignia when you sat down with a nice pice of red meat. We also found a really interesting blend of 84% Malbec, 8% Cabernet Franc and 8% Petit Verdot. Malbec is an intriguing varietal to me. Malbec is not grown in Bordeaux as much anymore due to its high susceptibility to vine disease. Malbec is having a rebirth though as a single varietal in South American wine regions with warmer climates such as Argentina and Chile. You can also find some California wineries having good success producing Malbec as a single varietal.